Designed to accommodate 5-8 persons, represents a completely new way of designing portable group shelters. Aside from the usual center pole the Hawu can also be pitched around a tree trunk or hung from a branch, no corner poles are ever needed. 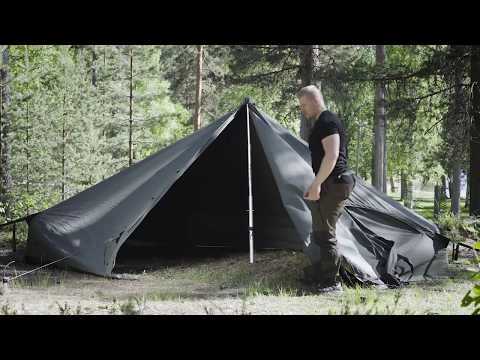 One half of a Hawu tent can be used on it´s own as a tarp. The option to use a wood burning stove for warmth makes the Hawu 8 the most versatile small tent around. The Hawu is designed to survive and help you survive extreme conditions in both military and civilian outdoors use. 3. Hung from a branch or any other point (telephone wires will work, but are not recommended). Corner poles are not needed, the corner lines are pulled tight using specialty buckles, this design makes the tent “float” in perfect shape. Pitching is extremely easy and quick, even solo! Due to it´s special design the Hawu tent can be purchased in parts. For the basic tent setup you need the Door half and Rear half. Depending on how you want to pitch it you will also need a central pole and/or pegs. These can of course be made from pieces of wood out in the field but the easiest way is purchasing ready made, purpose built pegs and poles. The complete Hawu tent provides shelter from bad weather and harsh conditions. However, even here in Finland, it sometimes happens that the sun shines and birds sing. During such anomalous weather you can adjust and adapt the Hawu to suit the situation, you can fold it open just a bit for a nice view or open it up completely and just keep the rear half as a wind shield. And when the weather gets real bad you can close all the hatches and add a wood burning stove and drying lines for wet clothes. For these the Hawu has a stove pipe port and tie down points ready and waiting. When you need more space you can add the Mid section which increases interior space to accommodate even more people.